We've been a bit light on crafting around these parts lately. Living in a hotel for the last six weeks (displaced by a house fire), hasn't lent it self well to crafting! This weekend hurricane Irene brought us some crummy weekend weather, and helped me decide that it was indeed time to get out the paints and brushes! Having limited crating supplies on hand, I decided we'd do a simple handpainting project. Amanda at the Handprint and Footprint Art blog recently posted a collection of Cute Handprint Crabs that I used to inspire our own crab project. Of course, we painted our crab to have it's own flair! We used fingerprints to create the eyes. I helped Ethan smear his fingers on the paper to create the water (I think this was his favorite part!) Mommy painted on the crab claws. And of course, when our crab was complete, I let Ethan go to town and create his own abstract creation! My favorite part of this project is asking Ethan where his crab painting is, and seeing him proudly walk over and point it out on the wall! How fun!! 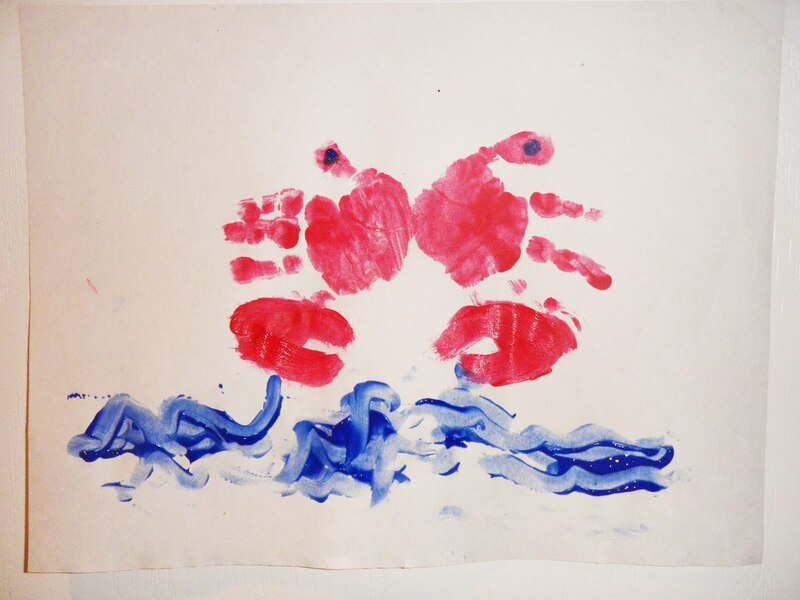 How will you add your own spin to the handprint crab? One of the things I wanted to do with Ethan this summer was #16 on my Summer Bucket List, to go to an art exhibit or an art walk. Our trip to the art exhibit at the State Museum in Harrisburg was such a success that we caught up with my friend Liz and went to First Friday in downtown Lancaster. So excited to get his own "painting" to hold!! Wish I could share the artist name, but the card was pretty "goopy" by the time he was done with it! We had a great time, but I am pretty sure that Ethan enjoyed it the most! He loved looking at the sculptures and the paintings. He loved the live music (someone even played him a special song on the piano all about Ethan). And of course, he loved walking around and smiling at everyone who would look his way! The moral of the story is that I was once again amazed by how much a baby can enjoy an art exhibit. It is known that babies enjoy looking at pictures and images, especially those that are high contrast. Must be even more exciting when those images are "larger than life!!" First Friday=Baby approved! 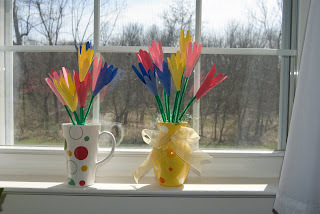 So get out there and inspire your little one's inner Picasso! Beginning at around 6 months of age, babies begin to enjoy playing "fill and spill" as they are learning to place objects inside containers and dump them out. Fill and spill containers are easy enough to come by around the house. An empty baby snack container or other food storage container with a lid, or even a plastic bowl or cup works just great. Experiment with different containers. You an fill the containers with just about anything. We've found that all those lots-of-links we have laying around the house, or clean baby food jar lids seem to work best. They are "small" objects, but not so small that they are a choking hazard. The baby jar lids are great, not only because they're free, but also they make a nice clanking noise. The lids sound even better when used in an old baby snack container with a metal bottom!! Try not only filling and spilling, but moving the items from one container to another!